With these two adult seagulls this is a less than friendly encounter. One seagull has already picked up a herring and the other wants the herring. 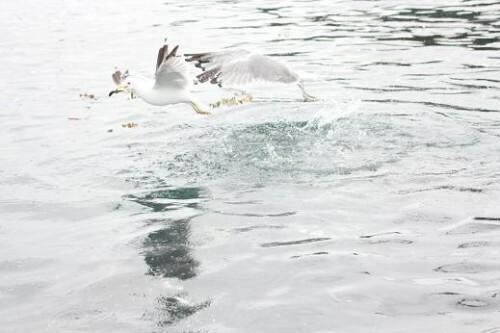 Or maybe the other gull had the herring and this one stole the herring. Either way it is not an “adult teaching a young”. Learn by observation or by doing? 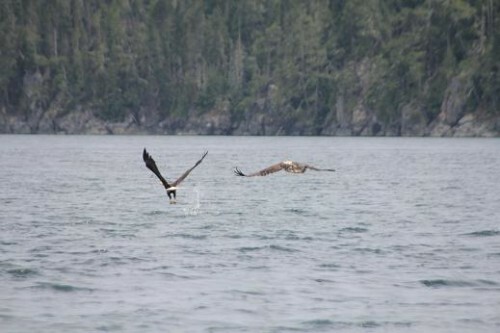 In the case an adult bald eagle has come down and picked up dinner from the surface and a young eagle is right on its tail to try and duplicate the action. Tomorrow’s post less so…. I posted a photo on August 26th of a grizzly bear and a deer that were in knee deep water and said: The chance of a bear catching deer is so low it is not worth wasting the energy trying. 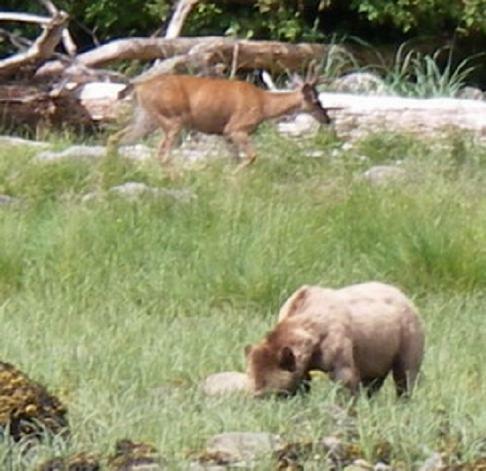 As proof of that statement here is a grizzly and deer almost side-by-side on dry land and still the grizzly has no interest. Where else would you rather be on a hot July day if you were wearing a fur coat. 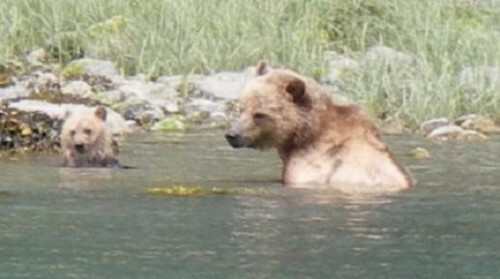 This behaviour is partially to cool down and also for the mother to get the cub to “like” the water. I have mentioned in other blog postings that cubs seem to have an aversion to getting wet but I have also seen mothers intentionally sit in the water to encourage their cubs. 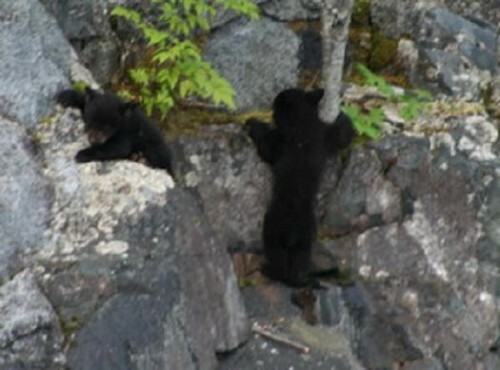 These two cubs were at the top of the beach on a steep rock bank. When were first arrived we though that we might have scared them off the beach but soon learned that they were trying to get to their mother on the beach. We waited and they did manage climb down and show no interest in our boat. The beach appeared to be a new experience for them and we were just part of that experience. If the mother shows no fear then the cubs have the same attitude. 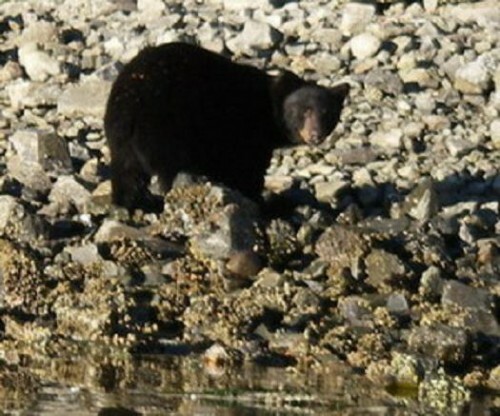 This mother black bear was concerned with our presence in the boat. The reason for her concern was because she is a mother and tomorrows post shows the problem…. Using the grizzly bear viewing stands after August 24th requires a short drive from the river estuary to the stands. On the drive we pass by the man-made spawning channel that contains thousands of salmon and many grizzly bears feeding. On this day a bear was standing on the road looking down into the channel to see if it was safe to continue down the bank to fish. 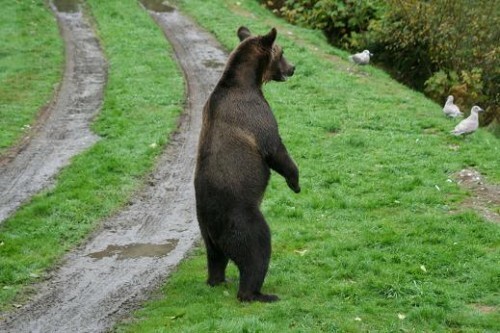 It is a minor problem when grizzly bear viewing is delayed by grizzly bears. Spring grizzly bears grazing on the sedge grass in the Glendale River estuary. This mother and cubs were frequent visitors to the estuary because of the protein rich grass and the good beach for rolling rocks for a different protein. Triplets are reasonably common and on occasion a mother with four cubs will pass through our viewing area. The reason the bear population is increasing is the number of births some of which are multiple births and with the abundance of food means most of the cubs survive. It is an interesting circle because when a pregnant bear hibernates if it is in good health (because of lots of food) the eggs are not absorbed and therefore more bears give birth and so on. 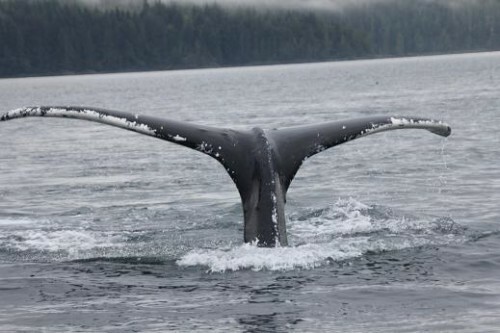 Not a good photo to be used for whale identification as IDs are based on the underside of the tail, which is called flukes with each side or lobe called a fluke. 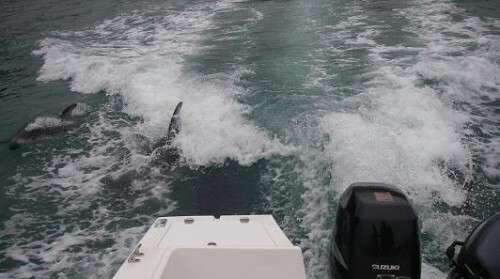 However this is a good photo if you are in the boat and a whale is coming toward you and dives close to the boat and you know that is is passing under your boat. Although this may look like a serious fight it is not. 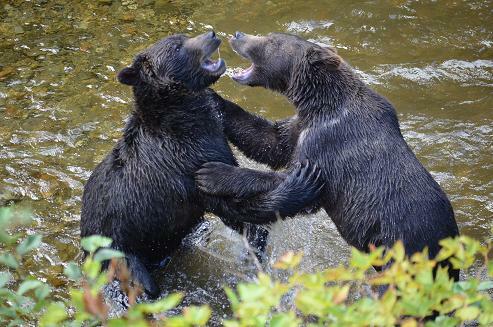 In late August after the salmon appear in the Glendale River the number of bears in the area increases from 10 to 12 to more than 40 but there is still so much food that it is not necessary to fight for a fishing spot. These are siblings doing what they normally do after they have had enough to eat – playing.